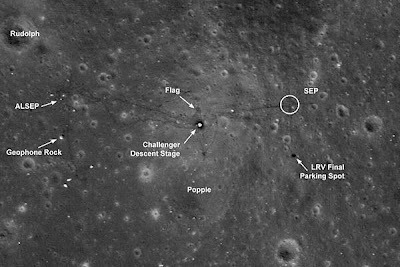 Space Blog: Moon Hoax Theory put to rest? Moon Hoax Theory put to rest? The images (below) are great and they are indeed solid evidence that the Moon landings happened. However this isn't new - various images have previously provided similar evidence, and of course NASA has a large body of other convincing evidence that can only be explained by real live Moon landings. The sad fact is that none of this will ever put the hoax theory "to bed". People who promote the theory are too heavily invested in it, and followers suffer from True Believer Syndrome which prevents them from ever accepting any proof. By tomorrow hoax believers will be claiming the latest photos are all part of the conspiracy. 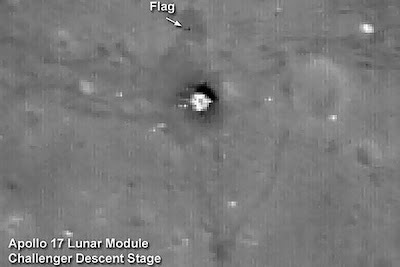 Eventually humans will land back on the Moon, and eventually the original landing sites will be revisted and preserved as historical sites. Hoax believers will continue to say it's all a cover-up. This is an argument that will never end.